Originally designed by leading architect Ellis Maples in 1963, it’s a course that welcomes novices, yet still challenges low-handicap players. In 2009, the course was redesigned and upgraded, including a 2.3 acre short range practice area and 122,000 sq ft of restored original greens complexes. Our award-winning golf course has been selected as one of the best in the area! For those who wish to hone their skills, there’s a complement of practice amenities, such as a driving range, putting green, and instruction from a PGA golf professional. From Santee: Travel on I-95 South to Hwy 301 towards Orangeburg. Travel approximately 23 miles and turn right on Broughton Street. Travel 1.5 miles on Broughton and turn left onto Pinehill. Take the First right onto Riverbank Dr. Travel 0.9 miles to Griffith Drive – the 2nd left. Turn left onto Griffith Drive and travel 0.7 miles to clubhouse. Use bag drop area upon arrival. From Columbia: Travel east on I-26 to Exit 145A (Hwy 601). Travel Hwy 601 towards Orangeburg. Follow for 5.0 miles and turn right on Russell Street. Then in 0.7 miles turn right on Broughton Street. Travel 1.2 miles on Broughton and turn left onto Pinehill. Take the First right onto Riverbank Dr. Travel 0.9 miles to Griffith Drive (it will be the 2nd left). Turn left onto Griffith Drive and travel 0.7 miles to clubhouse. Use bag drop area upon arrival. 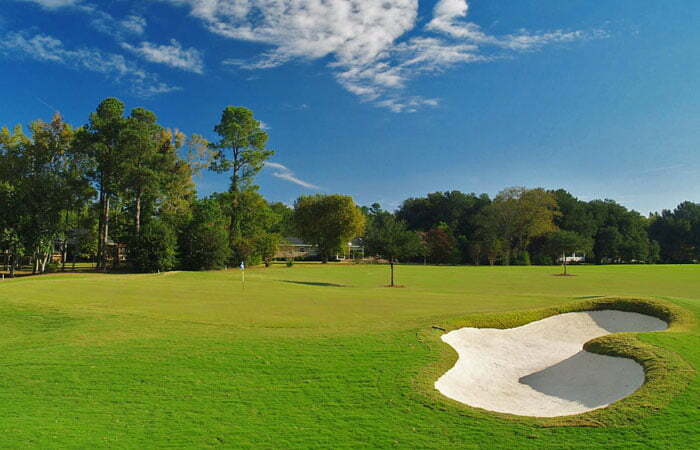 Features: Pro Golf Shop, Snack Bar, Blackwater Grille Restaurant, Putting Green, Driving Range, Short Range Practice Area, Carts, Lessons and Club Rentals. Dress Code: No denim allowed. Collared shirts or golf-appropriate mock necks are required. Cooler Policy: No private coolers or outside food/beverages. Coolers available to be stocked from snack bar. Course Policy: Faster players may play through. Carts to be kept on paths at all tees and greens. Players are requested to utilize bag drop service for efficient operation.